Learn how to maintain your fire pump with these three helpful tips! A fire pump is an essential element in your sprinkler system, so it’s crucial to ensure it is always maintained and in working condition. The fire pump is important for maintaining equal pressure at each sprinkler head in the system, so if the pump is not working, the entire sprinkler system is at risk of failure. Since your sprinkler system is not run on a regular basis, you won’t know when there’s a problem unless you take the time to maintain and inspect the fire pump. Your fire pump needs power, which may be an engine or an electrical motor, and that power source should be checked at least once a year. In addition to a routine inspection, the power source should also be cycled once or twice a year. Cycling enables you to maintain lubrication and allows inspection of the running system, and will also assure you that there is fuel available for the power source. It’s best to perform maintenance and inspections on the fire pump while uncoupled from the power source to ensure everything is moving freely. Use the appropriate lubricants on all moving parts and take the time to move them around to keep them from locking in place. 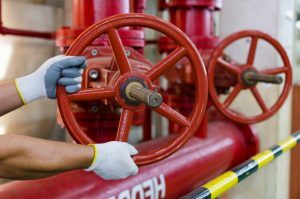 A fire pump is meant to last for many years, but without proper maintenance, it could seize and lock into place, resulting in a major fire safety risk for your building. Once a month, take the time to test random sprinkler heads that should trigger the system. Before testing, always notify the fire department and monitoring company to let them know you are just testing and there is no emergency. Also, silence all alarms to avoid scaring your employees with the drill. While implementing these tests, do a visual inspection of the system and sprinkler heads to look out for any obvious repairs. Contact Fireline to design, furnish and install all types of fire sprinkler systems, including fire pumps. Fire pumps can be an expensive addition to your sprinkler system but are absolutely necessary in the absence of a sufficient water supply. This entry was posted on Thursday, February 15th, 2018 at 11:57 am. Both comments and pings are currently closed.